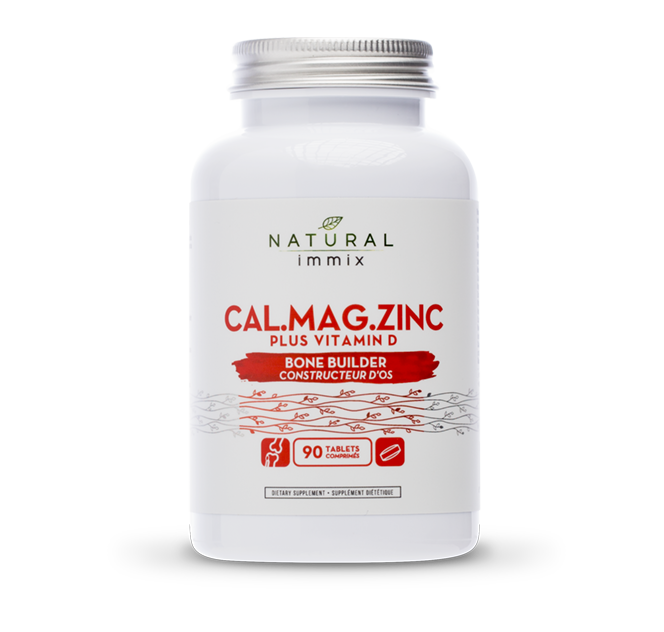 What is Cal Mag Zinc? As an essential part of our diet, Calcium plays many important roles in normal body functions. It is required for strong bones and teeth, regulating muscle contractions and nerve impulses as well as activating cellular enzymes. Magnesium acts alongside Calcium in our muscles while Vitamin D helps absorption and Zinc helps to boost our immune systems. Calcium, Magnesium, Zinc and Vitamin D are safe and effective choices for a supplement. As a factor in the maintenance of good health, Calcium, Magnesium and Zinc are traditionally used to help in the development and maintenance of bones and teeth. Calcium intake when combined with sufficient Magnesium, Zinc, Vitamin D and other co-factors, may reduce the risk of developing osteoporosis. Calcium: is an important mineral for the optimal functioning of many body systems, and is a major mineral found in bones and teeth. Deficiency of calcium causes bone and joint diseases such as osteomalacia, osteoporosis and osteo-arthritis. It also leads to poor growth and poor bone density in children. Calcium also protects the body from heavy metal toxicity because if calcium is deficient, lead is absorbed by the body and deposited in the teeth and bones. Magnesium: is an important catalyst for the body's chemical reactions, meaning that it increases the rate at which chemical reactions occur. Some of the most important chemical reactions that involve magnesium are in the Kreb's cycle, the cycle inside every cell that leads to energy production. Without magnesium the transmission of nerve and muscle impulses is compromised. This can lead to nervous disorders, depression and muscle weakness or twitches. Magnesium is a useful supplement for PMS symptoms that involves irritability and mood swings. Magnesium also decreases menstrual pain by relaxing the uterine muscles. In pregnancy magnesium acts as a uterine relaxant and can prevent premature labour. Studies show supplemental magnesium in pregnancy also decreases the risk of birth defects such as cerebral palsy. Magnesium is an important mineral for cardiovascular health as it regulates the heartbeat, prevents the calcification of arteries and relaxes arterial vessels to prevent hypertension. Magnesium has also been researched for its ability to reduce cholesterol, protect against osteoporosis and prevent cancer. Manganese, Copper and Zinc: are also present for better absorption and utilization by the cells, and they provide a valuable contribution to bone strength. Vitamin D (Cholecalciferol): is needed for health and to maintain strong bones. It does so by helping the body absorb calcium (one of bone's main building blocks) from food and supplements. People who get too little Vitamin D may develop soft, thin, and brittle bones, a condition known as rickets in children and osteomalacia in adults. Vitamin D is important to the body in many other ways as well. Muscles need it to move, for example, nerves need it to carry messages between the brain and every body part, and the immune system needs Vitamin D to fight off invading bacteria and viruses. Together with calcium, Vitamin D also helps protect older adults from osteoporosis because it acts as a hormone that allows the body to absorb and properly use calcium.